The subject had been taken into custody yesterday during a court appearance for probation violation. Lee Edward Vonthum, 47, is accused of attempting to smuggle drugs to an inmate in Chillicothe. He was admitted to the facility in 1994. An autopsy is scheduled to be performed. 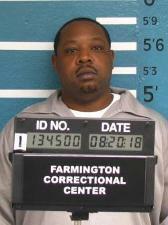 George Walter Black, 34, is charged with the death of another inmate at the Boonville Corrections Center.